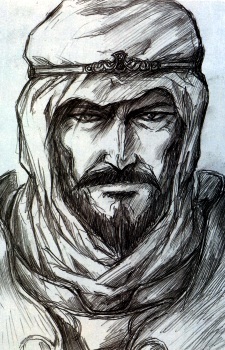 King Kashue, the Mercenary King, had gained his name by uniting the desert kingdoms with his sword. Now the king of the unified Kingdom of Flaim, he comes to King Fahn's aid in the war against Marmo. Soon after the war ended, activity began to stir at Fire Dragon Mountain. Shooting Star has awakened! He sets out there with his men to attempt to stop the ancient dragon. Parn has always had a fondness for the Mercenary King, but Kashue did not become a king for nothing. He refuses Parn's help at first because of his recklessness, but he realizes that without another path to take, Parn would follow him anyway (such as when he followed Kashue to Fire Dragon Mountain). And then, he learns of the rising darkness on Marmo, and King Kashue sees what must be done. He sends the call out to all kingdoms of Lodoss to rise up and face the rising forces of Marmo in one final battle, and the scope is enormous. Even the ancient dragons Narse and Mycin will clash.